STONEWARE: 2 gallon jar with bird; 5 gallon Red Wing water cooler with advertising (St. Paul Stationary); 5 gallon Red Wing water cooler with 5 in bottom; 4 gallon Red Wing Water Cooler; 6 gallon salt glaze churn with leaf; 5 gallon salt glaze rib cage jar; 5 gallon salt glaze jar with leaf; 20 gallon back stamp Minnesota stoneware butterfly jar (crack); Stag water cooler; 12 gallon & 15 gallon butterfly jars; 2 gallon birch leaf churn; 3 gallon salt glaze jar with blue decor; 20 gallon Red Wing jar with bails; 2 gallon birch leaf jar; Red Wing cattail cookie jar with advertising; advertising beater jars; mini advertising jugs; cherry band pitcher; sewer tile tree trunk umbrella stand; Red Wing lily pitcher; No 2 sleepyeye pitcher; sewer tile advertising pencil holder; 5 inch, 7 in. and 9 in. spongeware bowls; Western chick waterer made like jug; 3 lb. 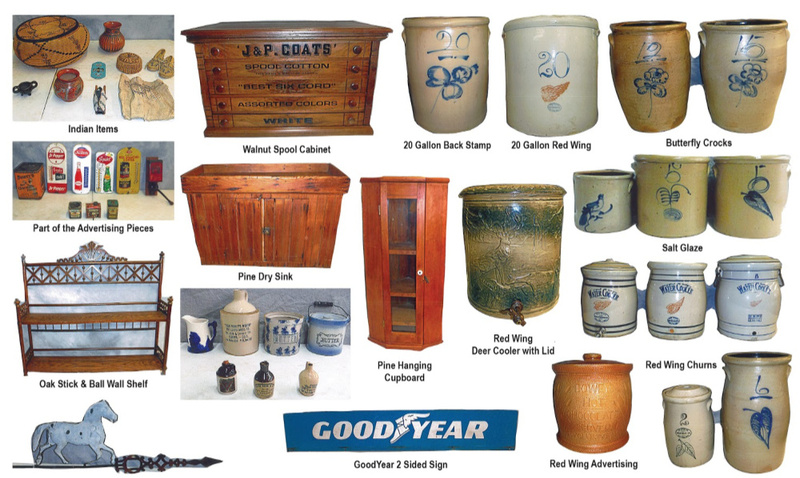 butter crock; 20 gallon Red Wing crock lid; cattail cookie jar; 5 gallon cooler lid with bar; 4 gallon button cooler lid; churn lids; Jack Sprat bean pot; Rock & Rye flask; (4) Red Wing pipkins; and many other pieces. ANTIQUES: Pine dry sink; pine dove tailed blanket chest; pine commode; walnut lift top bin; oak stick and ball wall shelf; pine hanging corner cupboard; oak child’s size parlor table; hanging kerosene lamp; B&H kerosene lamp; primitive wood pitch fork & shovel; nice hand sewn quilt; blue & white coverlet; J&P coats walnut spool cabinet; Stanley No. 45 plane with set of bits; folk art carved bowl & spoon; dry measures; pantry box; skaters lantern with blue glass globe; iron match holders; tin advertising match holders; walnut wall hanging clock with level; wood snow shoes; nice pair of Model T auto lamps; clock shelf with drawer and candle stands: (2) unusual brass ice cream dippers; early brass bicycle light; horse weather vane; wood duck decoy; “GoodYear” 2 sided tire sign; several metal advertising thermometers; Maytag oil can; Texaco 5 gallon can; Pepsi 6 pk. 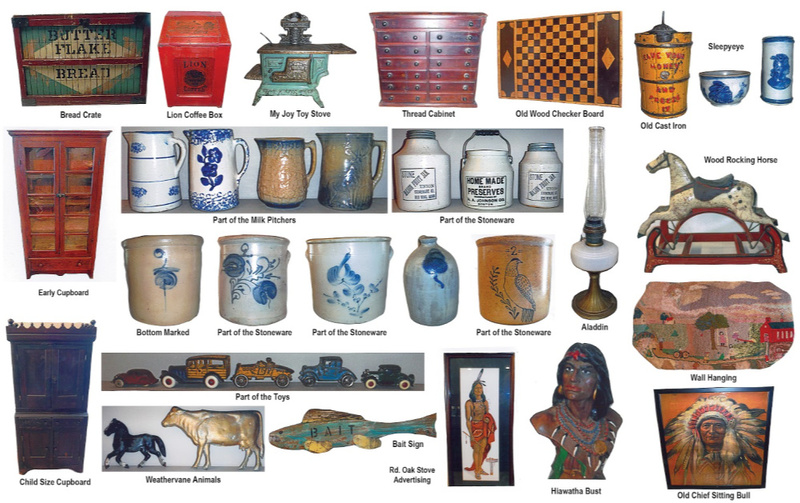 with bottles; Planter’s peanut jar; advertising trays; wall coffee grinder with advertising; advertising tins; square wood butter mold; wood sugar bucket; Cobalt swirl granitware; wood kitchen caddys; baskets; J&P Coats advertising box and lots more. INDIAN: Tavo Silviera polychrome vase; other S.W. pottery; large basket with lid; pine needle basket; several pieces beadwork; Pendelton Indian basket and more. ART POTTERY: 6 pcs. Van Briggle pottery; several pieces nice Red Wing pottery; brushware; Red Wing Hamm’s beer mug and other nice pottery. TERMS: Cash, Good Check, Absolute Proper ID Required for Bid Number • Lunch Served. PRIMITIVE & ANTIQUE: 13 drawer cabinet; early 10 pane cupboard with drawer base; child’s size breakfront cupboard; early wood step benches; (2) early stenciled chairs; center table with original paint; breakfront kitchen cupboard; harvest style table with drawer; child’s chest with tiger maple drawers; wood sugar basket with orginal paint; wood pantry box with original paint; wood decoys; early salt box/spice cabinet combo; (4) iron shooting gallery targets; old wood checker board; large cow & horse weather vane animals; Dietz scout lantern; wood fish decoys; “Peter Pan” free sample tin; wood bowls; wood egg case; wood storage boxes; old wood tea boxes; Metloch Hires root beer mug with Hires boy; old “Mammy” iron door stop; old iron terrier dog door stop; iron basket of flowers door stop; cast iron alligator nut cracker; iron lion with advertising (Lyons Best Flour); early cookie cutters; wood “Bait” sign; sho-fly rocking horse; wood rocking horse; Hudson Bay & Indian blankets; over 30 old figural Christmas tree lights; old paper maché Easter decor and candy containers; goose decoys; Aladdin kerosene lamp; early wall hanging (School Scene) and lots more. STONEWARE: Early salt glaze 2 gallon jar with bird; 2 gallon salt & glaze target jar with bottom mark “Minnesota Stoneware Co. Red Wing Minnesota”; Sleepyeye salt crock; Sleepyeye vase; (2) Red Wing fruit jars; “Homemade Preserves” with lid and advertising; several salt glaze crocks with blue decor; salt glaze jug with blue decor; several crock milk pitchers; stoneware pig bank and more. INDIAN: Indian picture with chief Do-Wah-Jac advertising round oak stoves; old picture of chief Sitting Bull; Hiawatha Indian bust; advertising Indian maiden picture with advertising “Hornung Hdwe.”; Skookum Indian doll; Indian maiden in canoe picture; Indian blanket; Hudson Bay blanket and others. OLD TOYS & BANKS: Cast iron “North Pole” ice cream freezer bank; (2) nice “Boys” tool chests; super “My Joy” cast iron toy stove; early pull type toy horse; “Deckers Iowana” cast iron pig bank; old cast iron Woody station wagon; cast iron race car; cast iron Air-Flo sedan; nice old cast iron coupes; press steel coupe; cast iron building banks; stenciled kid’s sled; metal Cowboy and Indian toys; early teddy bears; paper maché toys; old sand pails; toy drums; wood blocks and more. PICTURES: Nice framed watercolors and charcoals; framed prints; Chandler; camping & tent & river scene pictures. THIS IS A SAMPLING! EVERYTHING IS IN VERY NICE CONDITION! HANDPICKED BY TOM FOR MANY YEARS! TOOLS: Troy Bilt 3500 watt generator; 12 ton hydraulic press; Hobart Handler 140 welder with cart; Rigid Tri-Stand pipe vise; 2 inch pipe reamer; Toledo 2 inch pipe cutter; 1 inch-2 inch Toledo pipe threader; 1/2 & 3/4 inch Toledo pipe threader; airless paint sprayer with 60 ft. hose; flooring air nailer/stapler; parts washer cabinet and pump; 18×24 welding table; Klein MCM wire cutter; Milwaukee right angle drill; Milwaukee hole saw kit; Master fitter boring set (1/2-21/2 pipe holes); Milwaukee 3/8 hammer drill; Milwaukee saws-all; Senco decking screw gun & pail of 2 1/2 inch screws: 10 inch Delta chop saw; 14 inch metal cutting chop saw; Craftsman 16 inch chain saw; central pneumatic texture gun (new in box); 12 ft. fiberglass step ladder; ladder hangers; paper cart for masking; HVLP spray gun; refrigeration repair kit; 5 lb. R-22 freon; Robinaire vac pump; bearing driver set; seal driver kit; large size bearing separator; welding masks & gauntlets; 90 degrees magnetic welding clamps; vise grip welding clamps; 24 inch bolt cutters; brick and concrete tools; tire changing vise (6 & 12 inch rims); 6 inch DA air sander; carbide saw blade sharpener; Ryobi wood /metal door lock installation kit; tool boxes; engine stand and more. YARD/GARDEN 4 WHEELERS AND EQUIPMENT: Yamaha 400cc Big Bear 4×4 4-wheeler; Yamaha 250cc Bear Tracker; John Deere 332 diesel garden tractor with JD 44 hydraulic loader; John Deere 212 H garden tractor with 47 in mower deck & hydraulic lift; model 37 John Deere snow thrower for garden tractor; set of John Deere chains; 44 inch Swisher pull behind self-powered mower; 42 inch Swisher food plot harrow; land pride category 1 3 pt. blade; tillage cart with attachments (5ft. disc, swivel blade, ripper, swivel landscape rake); 13 gallon N. Star electric weed sprayer; 3 row food plot planter with seed disc; 7 rolls seed blanket; roll-around garden cart; MW 2 stage snow blower. TRAILERS: 4×11 2-wheel utility trailer with back load gate & side rails: ACME car tow dolly trailer with surge brakes, spare tires and tie downs. BOATS/RV ITEMS: 16 ft. Lund fishing boat with floors (25 HP Mercury electric start motor; Minnkota 45 5 speed foot control trolling motor; Aerated Live Well; support bows for cover; (2) batteries; 12 amp digital charger; 7 inch Lowrance GPS depth/fish finder; (2) captains chairs, original boat trailer); Pelican 11 ft 2 man bass boat with Minnkota 45 variable speed trolling motor; fish locator and seats; Minnkota 20 trolling motor; Minnkota 55 5 speed foot control trolling motor; Johnston 10 HP (1955-57); life jackets; 25 ft. 30 A RV cord; 2.6 ghz wireless network outdoor antenna; RV satellite antenna tripod; 5.7 GPM water pump; ACME car tow dolly trailer; back-up aide for RV’s & trailers; towing mirrors. BICYCLES: 1978 Puch racing bike; Schwinn mountain bike; Mongoose mountain bike; bicycle carrier; bike helmets. HOUSEHOLD: 10 cu. ft. deep freeze; cherry dining table and chairs; de-humidifier; humidifier; carpet shampooer; Lane cedar chest; gas grill; Kohler 22×19 lavatory (NIB); hamper; treadmill; holiday decor and more. OTHER ITEMS: Cabela’s 1 HP meat grinder; Cabela’s electric smoker; 25 lb. meat mixer; sausage stuffer; Colt fuse boxes; farm collectables; cast iron Franklin wood stove; Cessna airplane tow bar; runway lights; (2) 1500 watt electric shop heaters; box of 1968 Mustang parts; 24×42 shop table; shop cabinets; misc. plumbing & electric items and more.